Loco 381 standing outside the then Goods shed at Wirksworth. Sam Hodgkinson (top hat) and Emma. Loco (seen in high resolution) is number 381. Probably a Midland Railway standard goods engine designed by Matthew Kirtley and built by Robert Stephenson & Co, Newcastle in 1856. 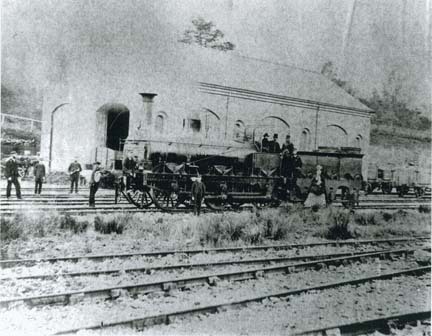 The Wirksworth line was opened in 1867. 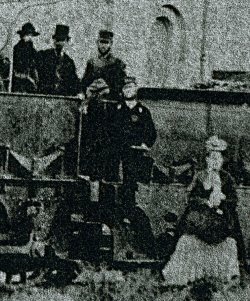 The man in the cab in top hat is Samuel Hodgkinson, Wirksworth station master, the woman is his wife Emma. 158A was built in 1866 to a design by Matthew Kirtley for express passenger workings to Kings Cross, then the London Terminus of the Midland Railway. 158A has been rebuilt at various dates and finally ended her days at Nottingham in 1947 as station pilot after 81 years service. She appeared at the Stephenson Centenary Celebrations, Chesterfield in 1948 and was preserved at Derby Locomotive Works until moving to the Midland Railway - Butterley in 1975. 158A is part of the National Collection owned by The National Railway Museum. Now takes pride of place in the Matthew Kirtley Exhibition Hall at Swanwick Junction. The Wirksworth branch served an unusual purpose in that its terminus was used by Derby Works as a prime spot for some of its official photographs. When the ex-Midland Railway locos were stored in the works, prior to the establishment of a national museum, the opportunity (in 1960) was taken to ensure their preservation on film and they were hauled up to Wirksworth dead in a train (complete with brake van) by the Midland Compound and duly lined up for the official photographer. The photographs were taken from the station platform and even at that late date a large plate camera was used. 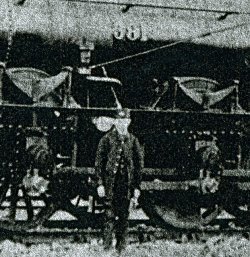 Shown here is Kirtley 2-4-0 No.158A.